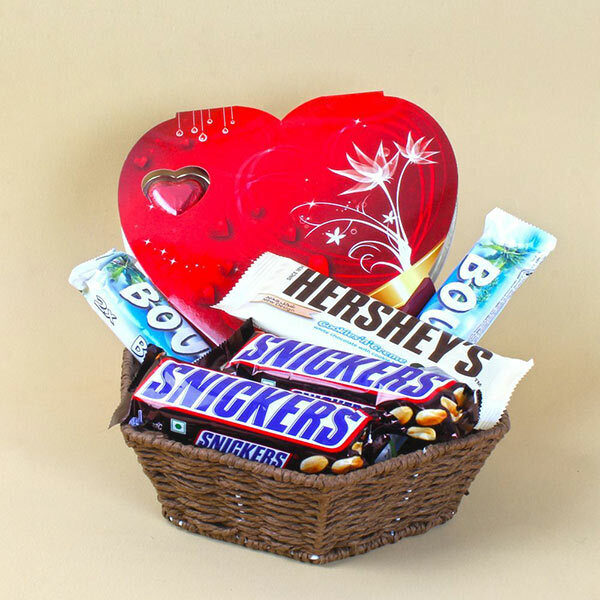 This Giftalove Luxury Gourmet Basket is nothing but a healthy treat which will give a pleasant surprise to the recipient who loves to stay healthy so to experience send this on any day at any time it is not required any special day to gift this product. This kind of gifts people really remember. With a bit of thought and effort, you can send it and specially to those who really need to enjoy great mix of fun food items. Exclusively Designed to cure all cravings, our thoughtfully curated food items collection is the perfect gift to satisfy every craving. Browse your favorite products, it is very conveniently available for online shopping from anywhere in India with Free Shipping. 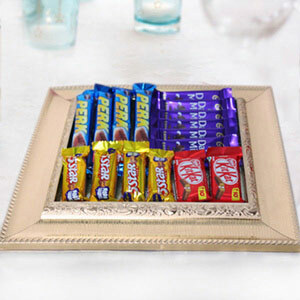 Heart shape Chocolate box (Weight:100 gms), Five Assorted Chocolates like Two bars of Snickers (Weight :50 gms ),Two bars of Bounty (Weight : 57 gms) and One bar of Hershey''s Cookies n Chocolate Flavour Bar (Weight : 35 gms) in a Basket.